Key speakers for the International Eucharistic Congress in Ireland 2012 are: Cardinal Peter Turkson, President of the Pontifical Council for Justice and Peace; Cardinal Rodriguez Maradiaga, President of Caritas Internationalis, Brother Alois, Prior of Taizé, Archbishop Michael Jackson, Church of Ireland Archbishop of Dublin and Glendalough, and Richard Moore, Executive Director of Children in Crossfire. The International Eucharistic Congress takes place in Dublin from 10 – 17 June 2012. The RDS and Croke Park in Dublin will be the central venues for the 2012 Congress. The Congress is a global event which takes place in a different country every four years, celebrating the central role of the Eucharist in the life of the Catholic Church. As part of the preparations for the 50th International Eucharistic Congress in Dublin next year, a meeting of International Delegates and the Pontifical Committee for the International Eucharistic Congress is taking place in Dublin this week. Today, in All Hallows College in Dublin, Cardinal Seán Brady and Archbishop Diarmuid Martin are addressing a meeting of the Pontifical Council for the International Eucharistic Congress on the preparations for next year’s Congress in Ireland. Details of both the online registration for next year, and the National Congress in Knock were announced at this meeting. Ahead of the International Eucharistic Congress next year details are now available for a National Eucharistic Congress in Ireland which takes place in Knock at the end of this month. Thousands of people from parishes all over the country will travel to Knock on Saturday 25 June to take part in a number of special events, workshops, celebrations and prayer – including the Knock Youth Festival, which is running at the same time as the National Congress. The National Congress in Knock will be a key opportunity for parishes and dioceses around Ireland to come together. Central to the National Congress will be the celebration of the Eucharist during which 26 candles will be blessed, one for each of the Cathedrals in Ireland. The candles will be brought back to each diocese and will be alight the next day to celebrate the Feast of Corpus Christi nationwide. Pilgrims wishing to come to Ireland to celebrate the 50th International Eucharistic Congress next summer can now register online. With 12 months to go, there are strong indications that there will be a truly global presence at the Congress in Dublin in June 2012. Already there has been confirmation that groups will travel from the United Kingdom and Canada as well as many other countries, including Taiwan, the Ivory Coast and Paraguay. Father Kevin Doran, Secretary General of the International Eucharistic Congress organising committee, said that looking forward to the Congress in Knock and the delegates meeting this week has brought great momentum to preparations. He said they were particularly pleased with the response to the National Congress. 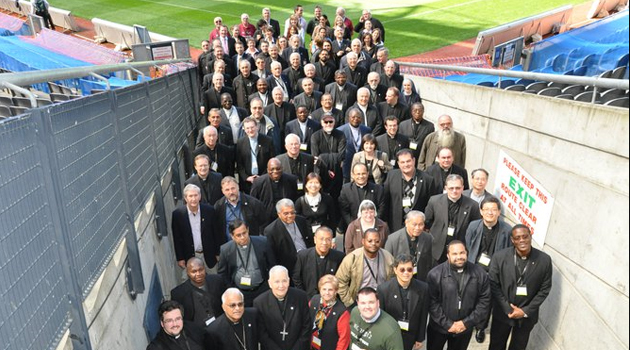 Delegates from almost 70 different countries travelled to Ireland this week to hear from Cardinal Seán Brady, Archbishop Diarmuid Martin and Eucharistic Congress organisers on how preparations for the International Congress were progressing. There were also detailed discussions and presentations from the International Congress Pontifical Committee and Theological Symposium. The delegates from 70 different countries represented Albania, Angola, Arab Countries, Australia and New Zealand, Austria, Balkans, Belarus, Belgium, Botswana, South Africa and Swaziland, Brazil, Bulgaria, Burkina-Faso, Cameroon, Canada, China, Costa Rica, Dominican Republic, Ecuador, El Salvador, England and Wales, Ethiopia, France, Germany, Guinea, Hungary, India, Italy, Kenya, Korea, Lesotho, Lithuania, Namibia, Nigeria, Papua New Guinea and Solomon Islands, Paraguay, Philippines, Poland, Portugal, Puerto Rico, Rep Dem Del Congo, Scotland, Slovakia, Spain, Sri Lanka, Switzerland, Tanzania, Thailand, Uganda, Vatican, Vietnam, West Indies, Zambia, and Zimbabwe. The National Eucharistic Congress takes place in Knock on 25 and 26 June. People can attend with their parish, in groups or individually. Registration for the workshops is essential at www.iec2012.ie. Knock Summer Festival 2011 takes place from 24 – 26 June in Knock see www.knock-shrine.ie/youthfestival. The festival is a three day event and is for all people between the ages of 18-35. The weekend will include: inspiring talks, creative workshops, vibrant music, a chance to meet new people, prayer, reflection, reconciliation, chill out time, clay and pottery, art, drumming, a huge gathering to celebrate the Eucharist .